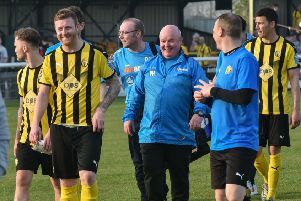 Brakes boss Paul Holleran was gushing in his praise for his side’s display on Saturday, and in a particular his side’s fourth goal from Kieran Dunbar, writes Paul Okey. Holleran admitted it was not a 4-0 game but said that any sense of injustice Spennymoor felt should not take away from Brakes’ performance. “It could have been a completely different story,” said Holleran who saw Tony Breeden save two second-half penalties. That quality was evident in a fine counter-attack for Brakes’ final goal of the afternoon which involved Kaine Felix, Callum Gittings and Dunbar. “The third man runs, the way Kieran holds his run, there were so many good decisions in that goal,” he said. “The passes, the quality of the runs, they attacked with real conviction. All three had periods with the ball and without the ball and it was as good a counter-attacking goal as you will see. While the pace of Felix and Dunbar caused Moors problems all afternoon, it was the performance of hat-trick hero Colby Bishop which set the tone in the opening 25 minutes, with Holleran highlighting the striker’s energy and workrate. “I’m delighted for Colby. He’s a good professional and he really wants to do well. “It’s hard to come across number nines and a lot of things he needs to add to his game are not down to ability. Leamington are in FA Trophy action on Saturday when they welcome Curzon Ashton to the Phillips 66.